Here’s the idea: The survival knife should be a part of you. You wear it all your waking hours (at least). You feel comfortable using it in almost any situation. Excluding hunting or combat, the survival knife is more important than a gun, and a lot more versatile. In fact, using it should be so automatic that you’re free to think creatively about what you can do with it. The reality is that like guns, it’s difficult to carry a large survival knife all the time and practicing with it is not necessarily easier than going to a shooting range. So many people, even those with military training or considerable backcountry experience might not be proficient with a survival knife in a true survival situation. For the average survivalist, if there is such a thing, acquiring and using a true survival knife is often a new experience. It can also be confusing. There are many knives on the market, some explicitly labelled survival knives. Which of them is really designed for survival situations? With potentially so much at stake and with the desire to own and use a knife as if it was, literally, an extension of your body; the selection of the right survival knife is arguably one of the more important decisions you’ll make for survival preparation. That’s why Survival Knives 101 was written to help out. It wasn’t written to promote any particular brand of knife, because frankly there is no ideal brand. In knives as it is in many other things, it is “different strokes for different folks” and we’d add different survival situations. We designed this series to introduce survival knives, in general, and provide useful background information about how to go about selecting one for your own situation and environment. We realize there are limits. The common expression, “I learned more than I wanted to know” applies. It’s easy to do have that happen with survival knives. Not far below superficial descriptions are ancient and massive topics in metallurgy, knife design, and knife using techniques. Some people make knives a lifetime study or persistent hobby, even going on to make their own knives. That’s great, but not the purpose here. 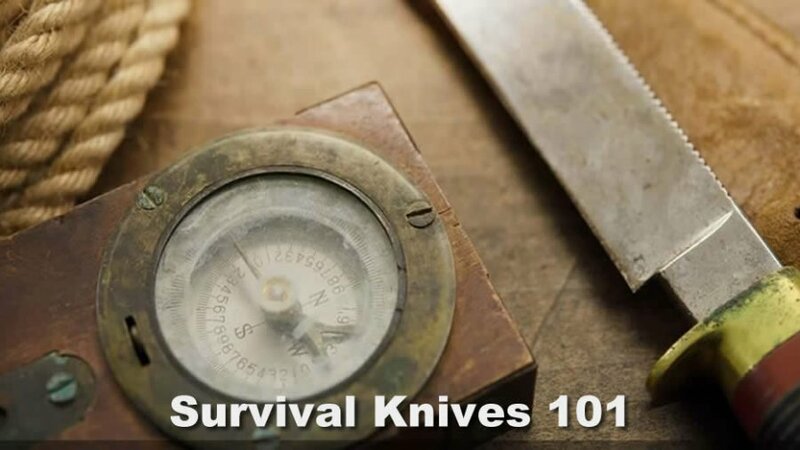 Survival Knives 101 is a backgrounder for the person who almost certainly has handled knives before, but is unfamiliar with the specifics of a survival knife. What is a survival knife? What makes it different from other types of knives? What distinguishes a good survival knife?